As our office has discussed over the past year (HERE and HERE, e.g. ), the expected pattern for the economy would be first more jobs, then higher wages due to a tighter labor market and then more individuals in the labor force looking for these more plentiful and/or better paying jobs. As the overall economy continues to improve and jobs are at an all-time high, more and more focus is being paid to wage growth. In particular, the Federal Reserve is closely monitoring wages and inflation to determine the underlying strength in the economy so they can begin raising interest rates (aka, normalizing monetary policy.) 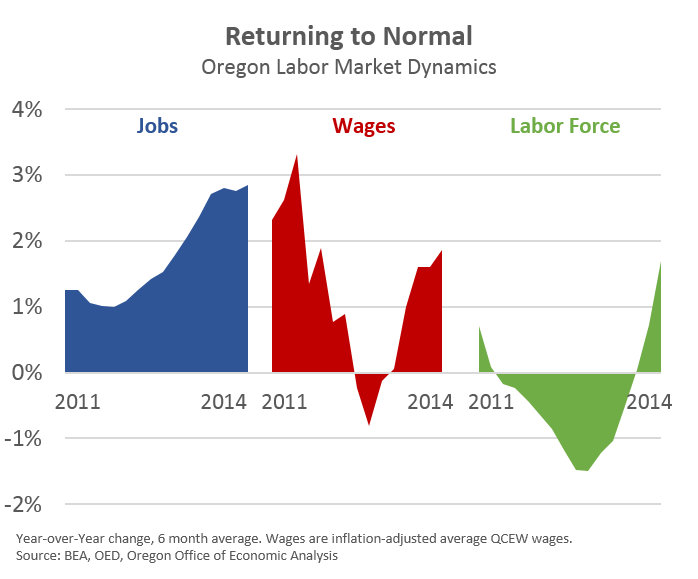 Well, the good news for Oregon is that these expected patterns of growth or labor market dynamics are emerging locally and may already be here. While we know job growth accelerated back in 2013 and the labor force followed suit in late 2014, the wages are a bit more of a muddled picture. We know for sure aggregate wages are doing well. Unfortunately for the typical worker though, the wage picture depends on which measure one uses. Below are 5 various measures of wages or earnings per worker and their cumulative change since the Great Recession. 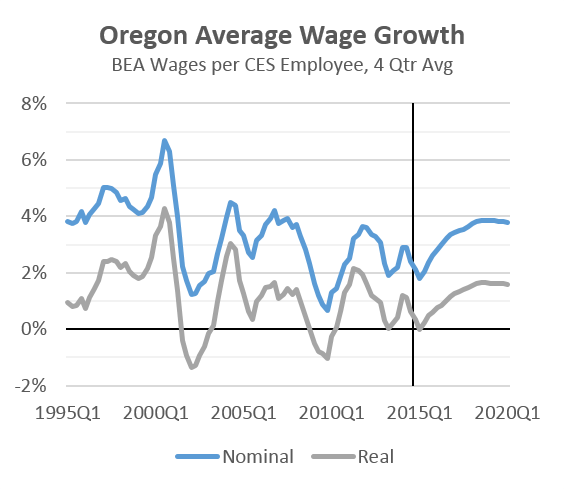 For our office’s core purposes (the state budget) we track the monthly withholdings out of Oregonian paychecks (this is the largest component of the state’s personal income tax collections) and use BEA wages in our economic forecasts. The good news is that we are seeing growth above and beyond the rate of inflation across most measures. 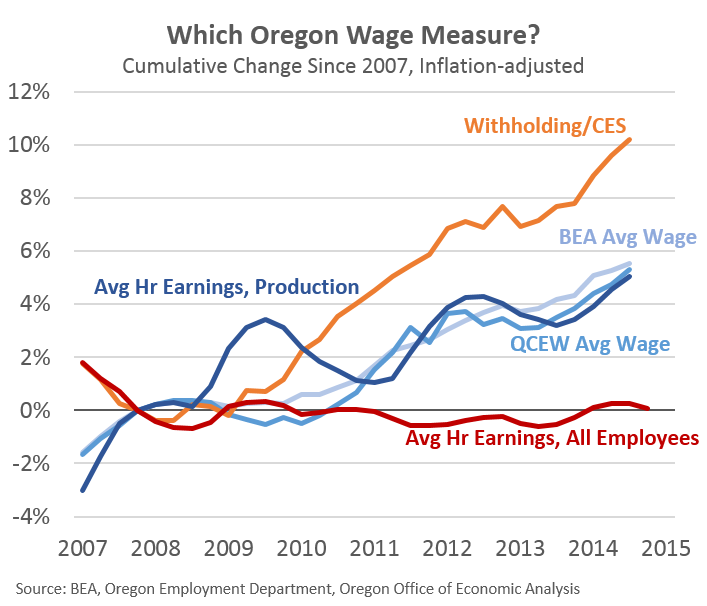 One missing piece here for the red line is that if employees aren’t seeing real hourly gains, but seeing more hours worked, their total paychecks are still going up, which matters most for household budgets, and state tax collections. A key piece to the outlook is average wage growth. Below is what our office currently has in the forecast. In brief it shows growth picking up over the next couple of years and reaching rates approximately on par with the housing boom expansion. These rates of growth are lower than those seen in the 1990s. Some improvement in wage growth is to be expected given the tighter labor market. However is this outlook too optimistic? Too pessimistic? This outlook is going to be a big part of our preliminary forecast meetings this week with our advisors.